The final week of the Savannah Black Heritage Festival culminates with a number of stunning musical performances. The Spelman College Women’s Jazz Ensemble takes the stage on Friday, February 20 at 7 p.m. in the annual tribute concert to the late Ben Tucker. Tucker was born in Tennessee but made Savannah his home for the past four decades. A jazz bassist and composer, he worked with such greats as Art Pepper, Billy Taylor, Quincy Jones, Grant Green, Dexter Gordon, Hank Crawford and Herbie Mann. His most famous composition is “Comin’ Home Baby,” which became a Top 40 hit for singer Mel Torme. Spelman College Jazz Ensemble’s unique combination of vocalists, wind instrumentalists and rhythm section has thrilled and excited audiences across the country with their innovative and soulful sound. Organized in 1983, under the leadership of its founder/director, Joe Jennings, this talented, nationally-renowned, all female jazz ensemble has toured throughout the United States, and has shared the stage with jazz greats such as Wynton Marsalis, Consuela Lee, Nancy Wilson, Leroy Jenkins, Valerie Capers, Dee Dee Bridgewater and Regina Carter. The concert will be held at the Lutheran Church of the Ascension, 120 Bull St. on Wright Square, free and open to the public. Sponsored in part by Seacrest Partners and the Lutheran Church of the Ascension. On Saturday, February 21, at 7 p.m., Janice Chandler Eteme will present “Miss Anderson’s Music: The Life and Songs of Marian Anderson.” An acclaimed singer whose performance at the Lincoln Memorial in 1939 helped set the stage for the civil rights era, Marian Anderson was born on February 27, 1897, in Philadelphia, Pennsylvania. By the late 1930s, Anderson’s voice had made her famous on both sides of the Atlantic. In the United States she was invited by President and First Lady Roosevelt to perform at the White House, the first African American ever to receive this honor. In 1955, the gifted contralto singer became the first African American to perform as a member of the New York Metropolitan Opera. Originally created by the National Portrait Gallery’s Cultures in Motion series, Janice Chandler Eteme will perform a musical narrative about the life of Marian Anderson. Ms. Chandler-Eteme first came to international prominence as a favorite of Robert Shaw and has in the years since collaborated with many renowned and respected conductors. She remains among the most in-demand sopranos for Gershwin’s Porgy and Bess. She holds degrees from Oakwood College and Indiana University and has studied with Virginia Zeani, Margaret Harshaw, Ginger Beazley and Todd Duncan. The concert will be held at St. Philip AME Church, 613 Martin Luther King, Jr., Blvd. Sponsored in part by The JC Lewis Foundation and St. Philip AME Church. The Bright Star Children’s Touring Theatre of Ashville, NC, will return and present multiple public performances of their productions of Rosa Parks and Forgotten Friends and Freedom Songs: The Music of Black History. 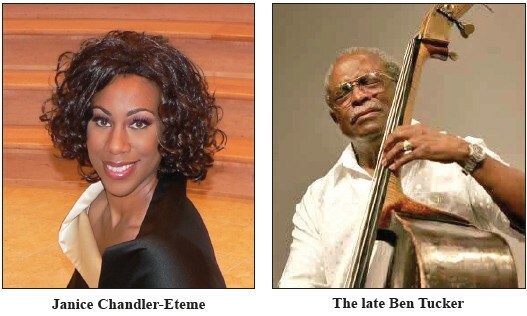 Also on the schedule is a performance from the Spelman College Women’s Jazz Ensemble at the festival’s second tribute to the late Ben Tucker on February 20 at the Lutheran Church of the Ascension on Wright Square. The festival will close on February 21 at St. Philip AME Church on MLK, Jr. Blvd., with Miss Anderson’s Songs: The Life and Music of Marian Anderson, a production from the National Portrait Gallery’s Culture in Motion Series. All festival performances and activities are free and open to the public. Visit www.savannahblackheritafefestival.com for updates or call (912) 358-4309.